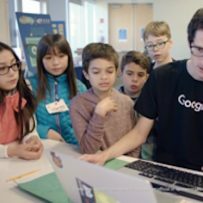 Google and Frito-Lay recently partnered to offer a competition to students interested in innovation and creativity. They invited St. Justin 5th graders to participate along with students from several other local schools. Sophia Samara, a St. Justin fifth grader, decided to attend. Students were challenged to come up with creative solutions to everyday problems. Robert Herjavec from Shark Tank helped moderate the event! Sophia’s team won the competition! She is now waiting to see if she makes it to the next level in this world-wide competition. Go, Sophia!